Fran Hudson (Blount) is a local Miami TV reporter who never shies away from a story that is potentially dangerous. After some drug-fueled murders in the area, an informant, Fargas (La Salle) points Fran and her trusty cameraman Mark (Mann) in the direction of a mysterious man named Brian Horne (Lynch). Horne was a disgraced Army Colonel who ended up in the employment of the infamous Jim Jones. He was said to have died in the massacre at Guyana, but recent photos have surfaced featuring Horne. Fran and Mark want to go deep into the jungles of Venezuela where they believe he is hiding out in order to interview him. This coincides perfectly with the wishes of their station manager, Bob (Bright) as well as Karin (Black). Bob’s son Tommy (Aames) has been missing and thought to be in the same area. So Fran and Mark have their work “cut” out for them, as they must report on the drug killings, find and interview Brian Horne, and rescue Tommy - all the while dodging the many pitfalls of the jungle, not the least of which is the violent and frightening killer Quecho (Berryman). Can they do it? 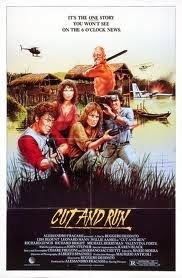 Out of all the jungle movies released in the 80’s, Cut and Run has to rank as one of the best. 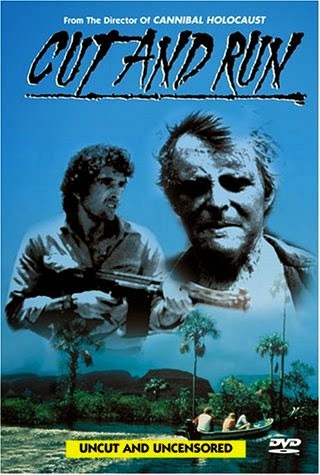 While it sits comfortably with other items on video store shelves at the time such as Cocaine Wars (1985), Cut and Run has a lot more going for it. Namely the strong cast, and equally strong direction by Ruggero Deodato, who most people would associate with Cannibal Holocaust (1980) - but here at Comeuppance we associate him with Live Like a Cop, Die Like a Man (1976), Raiders of Atlantis (1983) and The Barbarians (1987). Though, truth be told, Cut and Run shares more of the themes of Cannibal Holocaust than any of the other movies we mentioned - jungles, white people entering them and facing hostile Indios, and gore a-plenty. So while lesser filmmakers were off making nondescript El Presidente movies or Jungle Slogs (as we call them), Deodato corraled an impressive cast and raised the bar on all films of this type. 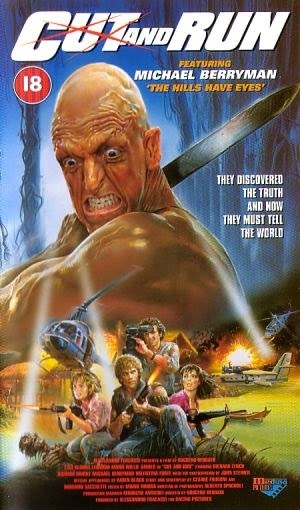 He set the standard for the 80’s video store-era jungle movie, and it has yet to be surpassed. Lisa Blount makes an appealing lead, and she’s an actress we don’t often get a chance to talk about. Eriq La Salle - much like his co-stars John Steiner, Gabriele Tinti and even Karen Black - puts in a colorful and worthwhile, but brief, role. Fan favorite Michael Berryman is on board doing what he does best, as is fellow fan favorite Richard Lynch. Both Berryman and Lynch have loinclothed goons - presumably no jungle movie would be complete without them. It’s hard to say exactly what’s going on with Willie Aames (or is it Willie Bibleman; not really sure) what with his curly mullet and Mickey Mouse tanktop over a red sweatshirt, but like Blount, we don’t get to talk about Willie too much on this site, so we were happy to see him in a non-Charles in Charge role. But seeing as how the movie was directed with energy by Deodato, and has typically-excellent Claudio Simonetti music, you can’t really lose...or can you? Actually, you CAN lose if you view the New World VHS. The Anchor Bay DVD is uncut so make sure that is the version you see/buy. The moments of well-executed gore are one of the main ingredients that set this movie apart from its jungle-based competitors. So make sure you see it all on the DVD. Corman and New World have a tendency to cut movies and make sure they don’t go “too far”, and Cut and Run was sadly a victim of that back in the day. But it’s been rectified now, so there’s nothing to fear. Except maybe Quecho. Cut and Run is a solid movie, and the DVD is a solid addition to anyone’s collection. Always wanted to see this, and you've sold me on it! I'll have to make sure to track this uncut version down pronto! Great review guys! I wish Deodatto made more films like this. Raiders, as you know, is one of my fav's! Good stuff. I saw this a while back on DVD, definitely a fun ride. This film was also released on DVD uncut as a double feature with the Brian-Trenchard Smith cult classic Dead-End Drive-In. Keith: Thanks for the info about Corman. RobotGEEK: Raiders is a classic and we're posting it this week! Ed: Totally agree, a total blast to watch. Venom: Cool. That's a solid double-feature.